Some of you may know that I’m from upstate South Carolina originally, but my father went to high school in Augusta, Georgia. Despite it only being 90 miles from my hometown of Anderson, I only visited two or three times. As I’ve gotten older and have learned to appreciate things of my parent’s generation a bit more, my interest in not only the game of golf, but that little tournament in Georgia, the Masters, has grown significantly. While I’ll never don a green jacket or even beat Brian Kint, our VP of Finance, in a round of golf, I still quite enjoy the humbling game. It’s Masters week and the and the azaleas are blooming, the dogwoods are showing off their beautiful colors, and if you appreciate tradition, Augusta is the place to be. I had the opportunity to attend a practice round last year, and I immediately fell in love. The stories of my dad picking up balls on the driving range when he was in middle school came to life, and I felt at home. After attending many major sporting events (having a press badge for two years in college), there’s not another event I would want to attend again as much as a day at Augusta National. What’s so special you may ask? Everything. The Masters was the sporting equivalent of Disney World except for no lines for food, amazing southern hospitality, and no cell phones. The lack of outside distractions was a true game changer, and if you haven’t been there, it’s impossible to explain. However, the folks in Augusta don’t simply sit on their laurels. They understand the importance of constantly improving everything. This is something we take to heart at DLRC as well. Not change for the sake of change, but the ability to be flexible must be part of the DNA of DLRC. Of course, we can’t make every change our customers want, but we certainly want to discuss any new ideas and improvements that are thrown at us. So, if you see something we can improve, please let us know! We will strive to improve ourselves, and we hope to enjoy the tradition this weekend. Why we love it: The High Relief Saint-Gaudens Double Eagle is traditionally considered to be the most beautiful design across all of U.S. Numismatics. This scarce issue comes from a low mintage of only 11,250 coins struck. This near-gem example possesses the eye appeal and overall surface condition of a true, complete gem as it is pristine with no detracting blemishes. Value: These were worth in the $25,000-$27,000 range in the last decade but they have adjusted to the new lower levels where they not only seem to be affordable, decent deals, but in our eyes, a downright good deal. 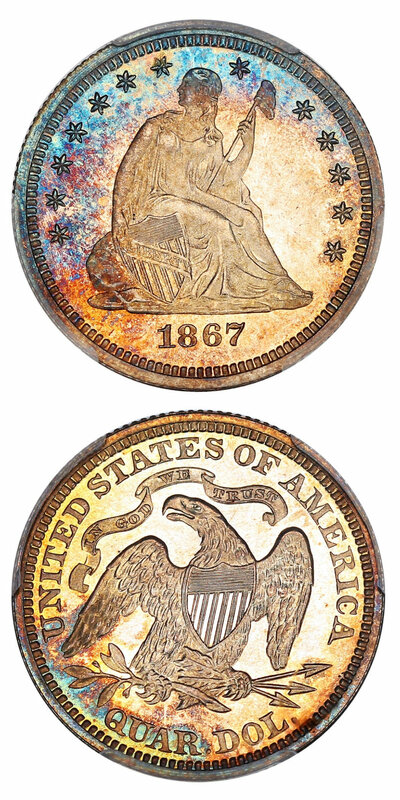 The PCGS Price Guide and CPG Value are quite comparable on America’s Most Beautiful Coin at this grade with respective estimates of $28,500 and $27,800. This lovely near-gem is available in this week’s auction with the reserve set thousands below both price guides at just $23,000, creating what we feel is an excellent value. Why we love it: This coin isn’t a mulligan, but is as close to an Eagle as any piece of pioneer gold. The first gold dollars struck in America were issued by C. Bechtler in 1831 and A. Bechtler in 1842. These first issues were sanctioned by the federal government and were struck from gold discovered in North Carolina and Georgia. The Reeded Edge is particularly noteworthy due to its rarity and being the first Reeded Edge dollar of A. Bechtler. There are examples that were proven to be misattributed by both services and until disproven, this is the sole survivor of a mint state example and therefore the finest known. 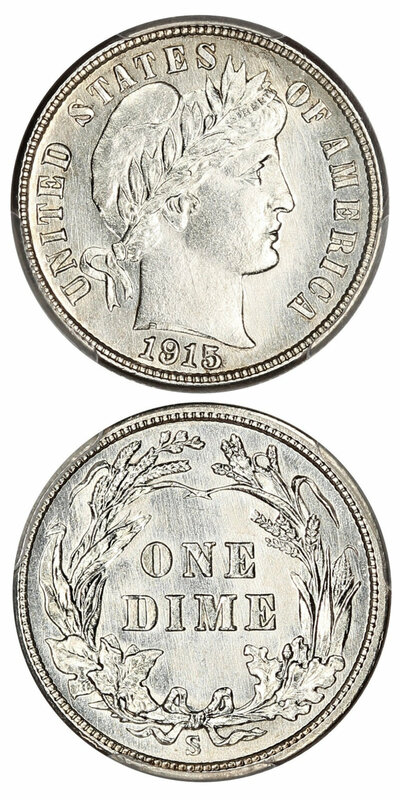 Value: his coin, being the finest known example for the issue on top of being the only Mint State example in existence, defines the phrase “one of a kind” and is incomparable to any price guide. In fact, PCGS does not currently record a value on the item. However, our reserve amount of $19,500 is set to acquire this rare pioneer gold issue, which we feel creates an excellent value to bidders. Why we love it: No, that’s not an albatross on the reverse… A slightly scarcer date in the Barber Dime series from the San Francisco Mint. This gem is head-turning in every sense of the term with its mark-free surfaces that are blazing white and covered in an extreme amount of luster. From a mintage of just under a million coins struck in which only two other examples are graded finer by PCGS, this example is perfect for a registry set. Value: The PCGS Price Guide and CPG Value are relatively close on this blazing white gem Barber Dime with respective estimates of $3,000 and $2,750. This lustrous stunner is available via Make Offer at a best price below both price guides at just $2,300. Why we love it: A desirable O-Mint Morgan whose scarcity grows slightly in high gem grades. A nearly blemish-free blast white gem with flashy, lustrous surfaces that are struck surprisingly strong considering where it was minted. Only seven plus grades are finer at PCGS with no 68’s in which just the slight amount of chatter on the cheek is holding our example back. Value: The PCGS Price Guide is set just below and a bit more accurately than the CPG Value with respective estimates of $3,250 and $3,750. This example is available via our Make Offer function at a best price of just $2,750, which in our opinion is a fantastic value. 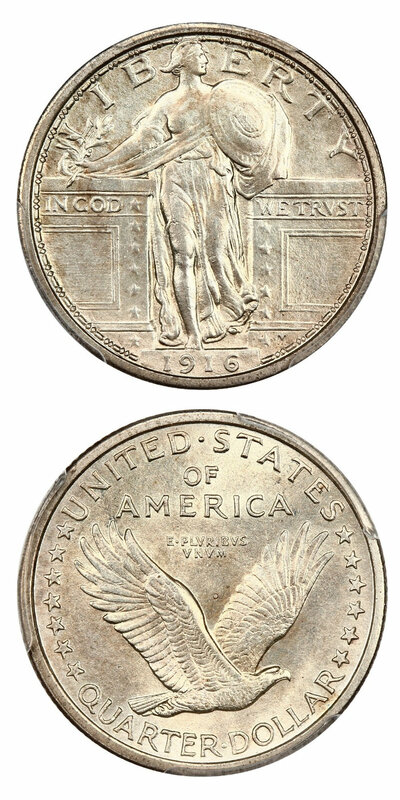 Why we love it: The 1916 Standing Liberty Quarter is a low mintage key date which has always been a "Hole in One" for collectors, as its popularity and scarcity both transcend the series and American Numismatics as a whole. This coin is sought-after greatly by collectors of Standing Liberty Quarters and Key Dates and truly, all serious enthusiasts of U.S. Coinage. This near-gem example of this famous issue has lustrous, mostly white satiny surfaces with a light golden-grayish tint and is even more desirable as it has a Full Head. Value: Another example of this famous key date in the same PCGS grade brought $24,000 in auction this past August, which happens to be the same number as the PCGS Price Guide. With the CPG Value even higher at $27,800 we find our reserve of just $23,000 in this week’s auction to be quite reasonable as it creates an excellent possible value to bidders. 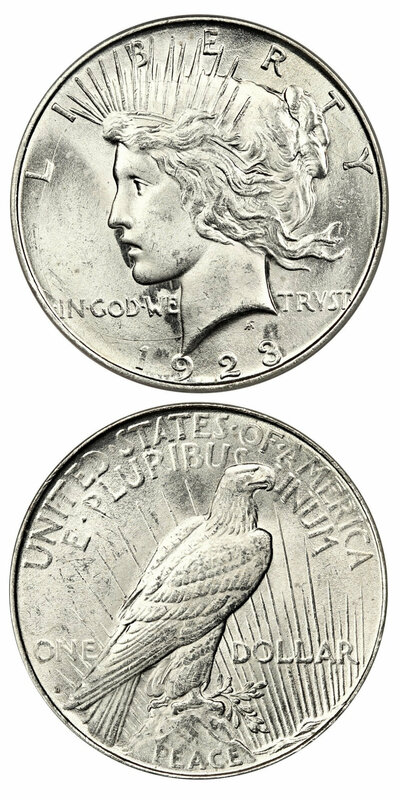 Why we love it: A gorgeous and original gem example of this scarce Liberty Seated Quarter issue with fantastic mirrors. Pretty blue, pink and orange highlights lightly cover these pristine, mark-free surfaces making for premium eye appeal. From a low proof mintage of just 625 coins struck in which only three other examples are graded finer by PCGS with Cameo surfaces. Value: The PCGS Price Guide has the value set for this coin at $7,500 in MS66 and $22,000 in MS67 in which they do not factor in any premium for a CAC Sticker. Between the beautiful toning and CAC approved high-end surface quality, this is the closest it gets to an MS67. This gem cameo proof Seated Quarter is reserved in this week’s auction at just $7,750. Why we love it: A popular and desirable Large Cent type coin housed in an Old Green Label Holder. Lovely rich red tones throughout these pristine, lustrous surfaces make the eye appeal pleasing. This coin is certainly a high-end example of its grade and features 100% red surfaces adding to the desirability. There are just 20 others graded finer at PCGS with none higher than a 66+. Value: The PCGS Price Guide has this beautiful Old Holder Large Cent valued at $3,000 even in gem MS65 with the full Red color designation. We are proudly offering a best price via our Make Offer Function at 10% off the price guide at $2,700. Why we love it: A popular D-Mint Peace Dollar of true registry quality that would be a fine addition to any high-end registry set as PCGS graded just one unaffordable 67. This gem is true to its grade and has absolute ideal eye appeal between its strong strike and blast white, lustrous surfaces. Its frosty, captivating look is competitive with any Peace Dollar at this grade. Value: The CPG Value has an estimated worth of this coin set at $3,560, which we feel is just a bit high and that the PCGS Price Guide value of $3,250 is right on the money. This frosty lustrous gem Peace Dollar is available via our Make Offer function at a fair best price of just $3,150.